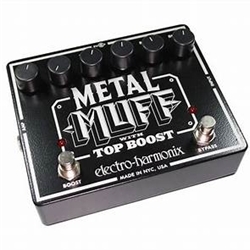 The Electro-Harmonix Metal Muff with Top Boost is aimed directly at our metal-loving guitarists and may just be the finest pedal for heavy metal ever created! The 3-band EQ boasts a Mid control that is perfect for contouring the midrange, a must for metal tones. The Metal Muff also incorporates a Top Boost, adding a bit more edge for solos and lead passages. The original Muff was a favorite with guitarists due to its violin-like sustain; with the Metal Muff with Top Boost, metal guitarists get their day in the sun!